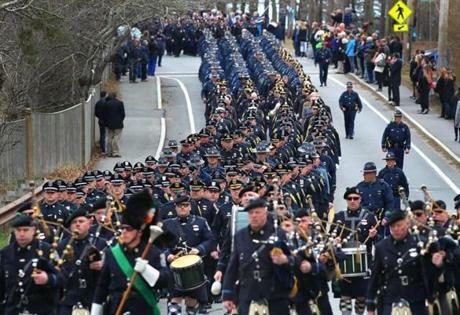 Bagpipers led police from all over the country in a procession to St. Pius X Church on Tuesday. 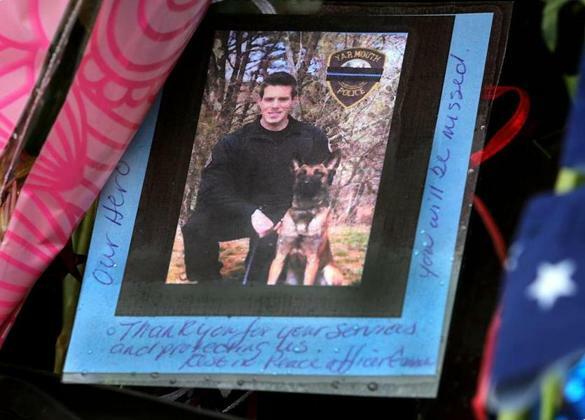 YARMOUTH — The body of Yarmouth police Officer Sean Gannon began its final journey Tuesday afternoon as thousands of law enforcement officers and Cape Cod residents gathered on the chilled streets here to attend his wake and reflect on his short but meaningful life. Gannon, 32, was fatally shot Thursday, allegedly by a career criminal, as the well-known canine officer attempted to serve a probation warrant in the Marstons Mills neighborhood of Barnstable. 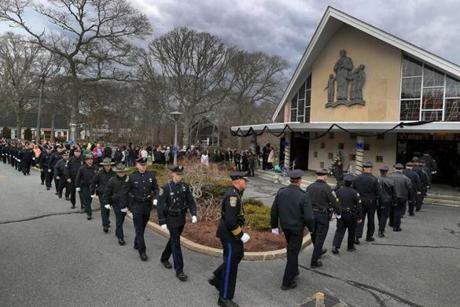 On Tuesday, Yarmouth residents struggled to contain their emotions as Gannon’s body was carried into St. Pius X Church for a service that drew a long line of mourners, many of whom knew the officer from his work in the community. Others simply wished to express their condolences and gratitude for a police officer killed in the line of duty. Katie Sears, a Yarmouth mother of six children, passed out blue ribbons as her eyes welled with tears near the church doors. Sean Ferguson, a 36-year-old Truro firefighter, lives near the church and watched with his wife and three young daughters as the crowds grew. Ferguson said he knew Gannon only in passing and recently saw him marching in the St. Patrick’s Day parade here. “These are the people that we should be looking up to, instead of celebrities and sports figures,” Ferguson said. 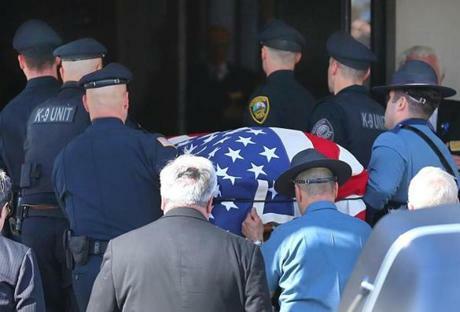 Yarmouth and Barnstable police stood guard over their slain colleague 24 hours a day at the Doane Beal and Ames Funeral Home in Hyannis before his flag-draped casket was taken to the church, where a funeral Mass will be said at 11 a.m. Wednesday. Police from all over the country held a procession and walk by and entered the church. Gannon leaves his wife, Dara, and many other family members, including his parents, Denise and Patrick. Governor Charlie Baker was among the first mourners to enter the church after the casket arrived. Gannon worked eight years with the Yarmouth police following three years with the Stonehill College campus police. He was allegedly shot by Thomas Lantanowich, who has pleaded not guilty to murder and is being held without bail. Lantanowich spent four years in state prison on drug and gun charges and has an extensive criminal history of more than 100 charges. 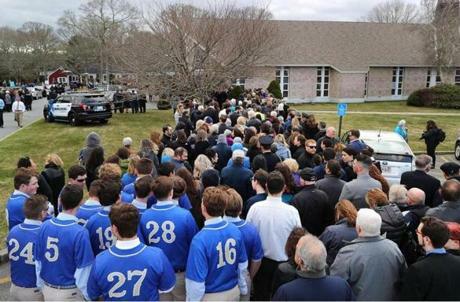 The Saint John's Lions baseball team from Hyannis waited in line at the wake. 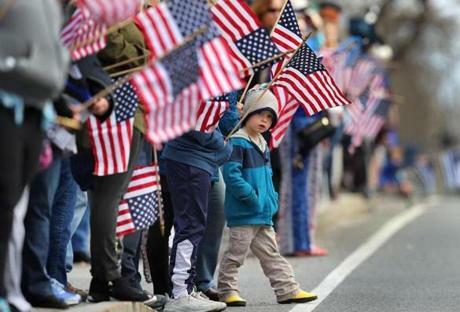 Near her, Joanne Powers of Yarmouth held an American flag as she waited for the black hearse carrying Gannon’s body. Originally from New Bedford, Gannon graduated from Bishop Stang High School in Dartmouth in 2003 and received a bachelor’s degree in criminal justice from Westfield State University in 2007. Jack Harris from West Yarmouth stood on the street in front of the church awaiting the procession. He volunteered at Big Brothers Big Sisters of Cape Cod and the Islands, and was known for simple acts of generosity, such as bringing coffee to town workers at the landfill. That’s who Katie Sears recalled — an upbeat officer who captivated residents as he gave demonstrations with Nero, his police dog. His death, she said, brings home the hard truth that tragedy can strike anywhere. “We feel on the Cape that we have a bubble of safety, and that all the bad stuff happens over the bridge,” Sears said. Now, she said, that sense of security has frayed. K-9 officers carried the casket into the church.